Sporty gas-pressurized shock from Betor. 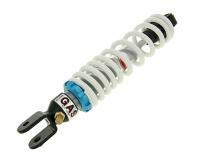 These shocks allow you to lower the spring weight and give a more pleasant ride. Looks great and finishes off the look of the bike. 295mm in length, eye to eye and adjustable preload thanks to the blue anodized adjuster wheel. Changing pressure is only recommended for those who know what they are doing.